Does your vehicle currently lack any sort of towbar setup? Are you looking to tow a trailer or caravan? If so, call The Towbar Company today on 07778 343464 for a FREE and immediate quotation. With years of experience to our name, our professional team will have your towbar fitted in no time. We fit all manner of towbars and also provide a range of towbar accessories, so get in touch today to find out more. Towbars are a necessary accessory for anyone looking to use their vehicle to tow a trailer or caravan. 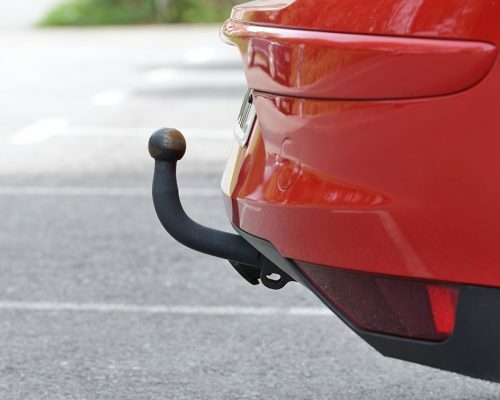 Vehicles don’t usually come fitted with a towbar as standard, and mounting a towbar isn’t as straightforward as it seems. Here at The Towbar Company, we provide a hassle-free service to those searching for competitively priced towbar fitting. Yeovil customers need only call us to find out more. Our team specialises in all types of towbars, and we provide a mobile fitting service in which we come to you. That’s right; you don’t even need to bring your vehicle to us. We’ll come to your home or place of work and fit your towbar, leaving you free to go about your day. We’ve provided Yeovil towbar fitting services in this manner for many years, so you can be assured of a professional service. For modern cars, we use the very latest wiring kits which allow for the towbar to communicate directly with the vehicle’s management system. As the best choice for a towbar fitting, Yeovil has to offer; we adhere strictly to the manufacturer’s specifications. All work will be carried out by our trained team of fitters and completion should take no more than an hour. In most cases, we can have the towbar fitted in less time. In addition to being the number one company for towbar fitting, Yeovil customers can also purchase their wiring kits from us too. We stock a wide range of kits including universal ones and ones specific to a make or model. Universal options are great if a specific model is not available, though because of the way they work, you won’t have full functionality when it comes to your vehicle’s onboard computer. Tail lights, indicators, brake and reverse lights will still function, but that’s about it. As such, we usually recommend that you opt for a vehicle-specific option. These options provide far more features including constant power, fog light deactivation, lamp substitution, trailer stabilisation, adaptive cruise control and more. As part of our Yeovil towbar fitting service, we can utilise either option, and you’re free to specify which one you’d prefer. For more information about our wiring kits or to book a towbar fitting in Yeovil, call The Towbar Company today on 07778 343464. Why Choose Us for Towbar Fitting Yeovil? If you’re searching for quality towbar fitters, look no further than The Towbar Company. Established for many years, we offer unbeatable prices and a service that is unparalleled. Our service is quick and efficient meaning you won’t be waiting around all day when booking in a towbar fitting. Yeovil customers can also benefit from our mobile fitting service. Wherever you happen to be located, we can come to you making life a lot easier. When dealing with our Yeovil towbar fitting team, you’ll have peace of mind that you’re dealing with fully trained and accredited specialists. We can fit towbars to both domestic and commercial vehicles and work to an exacting standard ensuring that your towbar provides many years of reliable service. What’s more, is that your vehicle’s warranty won’t be affected as our team are fully insured and work in line with the manufacturer’s specifications. So, for the most efficient company when it comes to towbar fitting, Yeovil has to offer, call The Towbar Company today on 07778 343464.